The HW100 Sporter was Weihrauchs first production Pre Charge rifle. 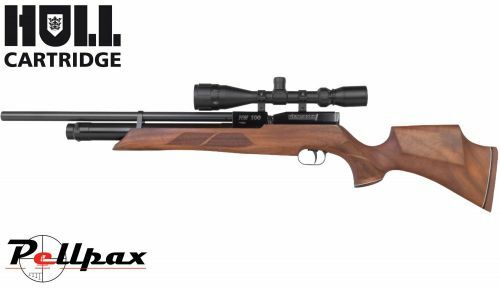 The gun has an established position at the very top of the PCP air rifle market for 2 good reasons : its fantastic build quality and pellet on pellet accuracy. The model is an evolutionary step forward in terms of Weihrauch PCP design and has been built by the German manufacturer to be incredibly precise. This is complemented wonderfully by the guns ergonomically shaped stock that fits snugly into the shoulder of almost any sized shooter. This carbine version of the gun has a shorter barrel and is much lighter than the original full length version. The gun is without a doubt one of the quietest airguns on the market and provides incredible accuracy making it one of the most effective hunting rifles on the market today. The biathlon reloading system is incredibly easy to use and very reliable and allows for lightning fast follow up shots. Please call to check availability.